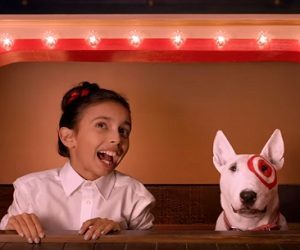 Target invites you to make the holidays spectacular in their latest commercial specially released for the holidays season. The 30-second spot, titled “Getting Ready For The Holidays”, features a young girl trying to organize a spectacular big show, helped by her pet, a bull terrier, and several toys, such as Iron Man, who takes care of the lights, a Barbie doll, who sets troll Poppy’s hair, Lego soldiers and minions, who play in an orchestra. After talking to each one of them and ensuring that all her “assistants” are following her instructions, she is convinced, and her four-legged friend as well, that the show is going to be spectacular. The commercial ends with the draw of the curtains and the onscreen line “Make The Holidays Spectacular”.